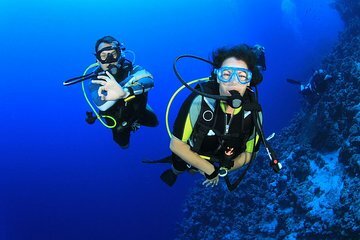 Dive into the glass-clear waters of the Mediterranean for an unforgettable scuba diving experience, and discover an underwater world filled with vibrant corals, secret caves and schools of exotic fish. This full-day cruise from Kemer is suitable for complete beginners and includes two dives and lunch onboard, plus plenty of opportunities for swimming and snorkeling in-between. It was our first experience in scuba diving so it was interesting to have such a different feeling to your body. However, sea is not the greatest, as there are not too many things to see under water we stopped by a rock and saw a lot of all grey fishes. When stopped for a second dive, there was nothing interesting to see at all, but nice to keep on trying.